Do you feel like your hair has a mind of its own? Sometimes like lying stubbornly flat on your head where it shouldn’t be and sometimes curling in a weird way that annoys you the most. Well, it is obvious to blame the array of products that swear to lift and give volume to your locks. But the wrong brush may be the real culprit for your stressed tresses. When it comes to choosing the right hair brush, people get confused. There is certainly no lack of brushes to choose from like an anti-static brush, vent, metal brush and a lot more. To ease up your task here we came up with a perfect guide to help you find your bristled soul mate. For the fine, short hair especially pixies, you need a brush with wide bristles detangle. A vent brush is a great option for you to style your hair without making it fluffy or poufy. Meant for detangling and taming frizz, this brush adds volume to hair and can also work great as a blow-drying tool. When it comes to brushing and styling normal-to-thick hair, reach for a brush with a mix of nylon and boar bristles. With a larger surface area for ease of styling, it will be a great option for everyday styling. Also, by distributing your scalp’s natural oils throughout the hair, it helps you keep your hair looking shiny, smooth and healthy. Struggling with thinning hair? You need a sensitive bristle brush that will not cause more damage to your hair. Use of wrong brush can result in a great deal of damage to your hair. Hence choose the one that is super gentle to use. Are you blessed with a gorgeous head of curls? You may think to brush hair without damaging it just impossible for you. But using the right tool can solve your problem like never before. If you are looking for a way to detangle, blow-dry or add shine to your damp curls, for a finishing brush with widely spaced ionic nylon bristles is the right choice for you. Finding the perfect brush for tame a thick, coarse mane can seem like such a struggle! If you feel the same, then try out vented brush with wide-spaced nylon bristles or Paddle brushes. With sparser bristles, it penetrates through your denser strands and easily removes tangles. For those who are looking to add volume, a large oval brush is a perfect option for you. 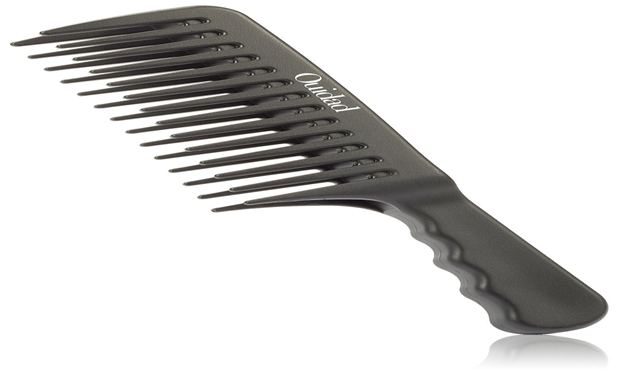 Coupled with the boar and nylon bristles, the comb will raise the volume of your hair to new heights. Use it on your damp hair to pull up on your roots while blow drying your hair. Hair becomes extremely fragile when wet, so the careful choice of tool will save you from hair fall. It can be a complete hair savior for curly hair or hair with any sort of tangles. Allowing more hair to pass through its larger width in-between the teeth, it can easily remove any aggravating tangles. Keep these points in mind to get the right hair styling brush that is meant for your hair type. Moreover, if you wish to get a smooth and straight hair without many efforts, try using an Anti-Static Brush.